The project of the artist from Lebanon exhibited at the Hamburger Bahnhof in Berlin, 2006. The exhibition "The Atlas Group (1989-2004). A Project by Walid Raad" in the Nationalgalerie im Hamburger Bahnhof – Museum für Gegenwart – Berlin is showing the most extensive overview yet on this project. The years given in the exhibition title signal a temporal closure that, like most factual information in the context of The Atlas Group, should not be understood literally, but rather put in doubt. The Atlas Group set itself the goal of documenting and researching the present and history of Lebanon, in particular the years of the Lebanese Civil War (1975-1990/91), so its theme is also always the continuing effect of all the individual and collective experience that constitutes history in the first place. 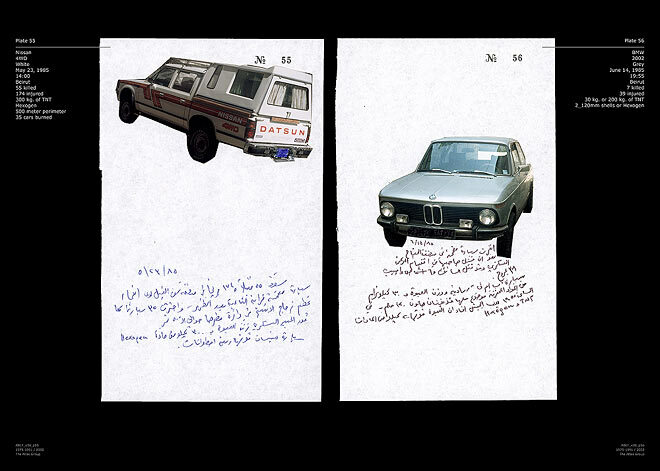 The archive set up by The Atlas Group brings together not only found, but also intentionally invented photographic, audiovisual, and written "documents" of everyday life in Lebanon. From the collection of photographs, the Berlin exhibition presents a selection from eight series, supplemented by five video works. All these "documents" are accompanied by entries from the archives that provide supposed insight into who originated them, how they were created, and how they came into the archive’s possession. For example, the notebooks, photographs, and 8-mm films from the estate of the (fictional) Lebanese historian, Dr. Fadl Fakhouri, found their way into the archive. The film "Miraculous Beginnings" was made on Dr. Fakhouri’s wanderings through Beirut. Whenever he thought the civil war was over, he took a picture. Since the history of the Lebanese civil war was long and characterized by numerous ceasefires and re-igniting battles between armies and militias, the film testifies to the lasting hope for peace and normality and the will to capture these hopeful moments in pictures, in the awareness of their transience. The film "No, illness is neither here nor there" similarly abstractly conveys a feeling for everyday life during war, which is shaped by violence, since it shows in rapid montage a huge number of advertising signs for surgeons, psychiatrists, and orthopedic specialists – fields that apparently flourish in wartime. While most of these archive materials have a seemingly private character, the 100 black-and-white photographs from the series "My neck is thinner than a hair: Engines" come from Beirut documentation centers. They show the motors propelled out of their vehicles, which, as is widely known, took on a new function as weapons in the civil war. After the car bombs detonated, only the motors remained as whole, visible remnants – isolated (and thus abstract) testimonies to powerful explosions. Though almost all the pictorial and text material in the Atlas Group Archive concentrates on the time of the civil war, violence and fright are thereby never explicitly depicted, but always as "absent" and yet present as a reality deeply shaping daily life. The effects of the daily, unimaginable cruelties of the civil war are reflected not least in strangely distorted, "perverted" behavior patterns, for example the "race", described in the text accompanying the work, of the war correspondents to be the first to find and photograph the motors catapulted hundreds of meters from the sites of the car bomb detonations. Another photo work from the "Fakhouri File" testifies to similarly twisted patterns of perception and depiction. "Notebook volume 72: Missing Lebanese Wars" portrays the Sunday outings to the horse races taken by Lebanese historians of various religions and political convictions. There they don’t bet on the winning horse, but on the temporal difference between the winner’s passing the goal line and the photograph of this moment by the racetrack photographer. The bet is won by whoever most precisely predicted the temporal difference, the photographer’s "error". This work focuses on the professional work of historians – of the "experts" for determining and depicting history – and thematizes the expressive power of the photographic image and its susceptibility to manipulation by the historians (some of whom bribe the photographers! ), and its title also evokes the various implications of the word "missing" – failure to achieve, lack, but also longing for; so this creation can be understood as a key work of The Atlas Group. The video "Hostage: The Bachar Tapes (#17 and #31)_English version" makes explicit reference to political history. At the center here is the (fictional) Lebanese hostage Souheil Bachar. Bachar describes the three months as a hostage he shared with five Americans, whose imprisonment and release in the mid-1980s stood partially in connection with high-level political events, like the Iran-Contra Affair. Their stories are well known through Western media reports and the books they wrote after their captivity, but "Hostage" in turn is an attempt to reveal the "blind spot" of a Western-dominated media representation. In the series "We decided to let them say, ‘we are convinced,’ twice." the exhibition visitor is finally confronted with images of the Israeli invasion in Beirut in 1982. Five years ago, Walid Raad gave the archive these photographs, which he took in his youth. They are images frighteningly similar to the most recent reports from his homeland; their near-indistinguishability does not so much narrate the return of history as its stubborn continuation. A catalog, "The Atlas Group (1989-2004). A Project by Walid Raad" appeared for the exhibition. Exh.cat. Nationalgalerie im Hamburger Bahnhof, Museum für Gegenwart, Berlin 2006. Eds. Kassandra Nakas and Britta Schmitz. Cologne 2006. Walid Raad is also a member of the Fondation Arabe pour l’image (FAI), which was founded in Beirut in 1996 and collects and exhibits photographic testimony from the Arab world; cf. www.fai.org.lb. The Atlas Group Archive’s fictional character makes it a kind of counter-archive to the FAI. This accompanying information is the basis for the performances that Walid Raad gives in the form of "lectures"; on this, cf. the contribution by André Lepecki in: "The Atlas Group (1989-2004). A Project by Walid Raad" (as in FN 1), p. 61-65. On this, cf. Regina Göckede: Zweifelhafte Dokumente. Zeitgenössische arabische Kunst, Walid Raad und die Frage der Re-Präsentation. In: Regina Göckede, Alexandra Karentzos (Eds. ): Der Orient, die Fremde. Positionen zeitgenössischer Kunst und Literatur. Bielefeld 2006, pp. 185-203. Art historian, author and curator based in Berlin. Together with Britta Schmitz, she has curated the exhibition "The Atlas Group (1989-2004). A Project by Walid Raad", Nationalgalerie im Hamburger Bahnhof, Berlin. Richly illustrated, four essays (German/English), ed. by Kassandra Nakas and Britta Schmitz.